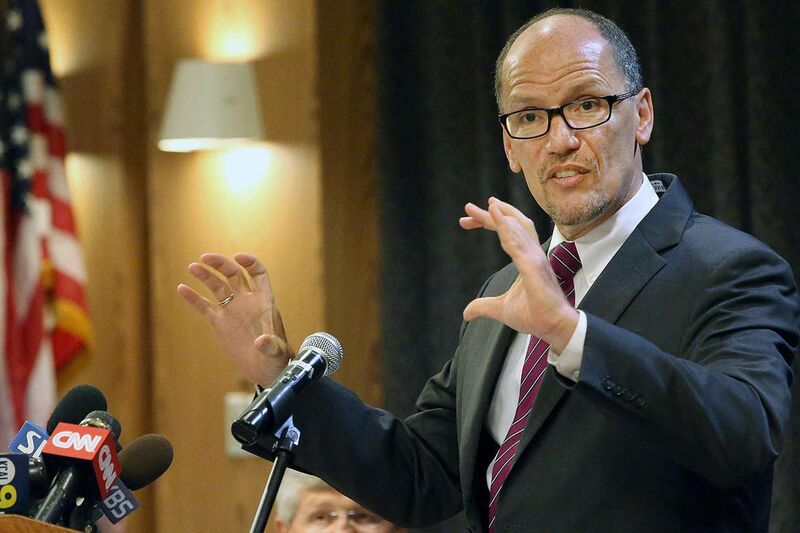 U.S. Labor Secretary Thomas Perez's department is cracking down on tactics used to sell retirement investments such as annuities. Hugh Cunningham will tell you he doesn't know much about the new U.S. Department of Labor regulations, introduced in April, that govern retirement investments such as annuities, though he's an investor in annuities. This much he knows firsthand, though: He wasn't happy with some old sales tactics behind the complex products. A few years ago, when the Washington Township resident was on the cusp of retirement, he wanted to put a portion of his assets into something that would generate income after he stopped working. First, he attended some free-lunch seminars. He brought along his financial adviser to get a second opinion while listening to the pitch. "They wouldn't let my guy come in," Cunningham said. The soon-to-be-retiree ended up attending by himself. During the free lunches, he said, sales agents were vague about why they were selling only high-commission annuities - and what those commissions actually were. Cunningham left without buying, went back to his financial adviser, and found an independent insurance agent through whom he bought two annuities in 2012. Said Mark Mensack, the adviser who was turned away from attending with Cunningham: "I'm a fee-based RIA [registered investment adviser], and I needed to be with my client and act as a fiduciary. "I like some of the living benefits on the annuities. You can turn a pile of money into a pension," Mensack said. "It's just a shame the insurance companies that offer these don't have fee-based versions of annuities. "But I believe that's what will result from the new DOL rules," he added. "The insurers can create those - it's just a matter of getting rid of the current commission structure." Last month, the Labor Department said those who sell to or advise retirees must be governed by a fiduciary standard, in the best interest of investors. The regulations governing sales to retirement plans - and, by extension, products such as annuities - ran to roughly 500 pages. The legislation is so complicated that insurance companies are now huddling to determine how the business will change. They have a year to comply. In the meantime, consumers can take matters into their own hands, as Cunningham did. He chose an independent agent, William Borton in Marlton, who explained there are lower-commission annuities, with discretionary bells and whistles such as income riders available. Borton detailed the commissions every step of the way, as well as potential surrender charges, which can be steep. An annuity is a contract between you and an insurance company that requires the insurer to make payments to you, either now or in the future. But annuities come in so many versions, with embedded or invisible fees, that they can be hard to understand. Independent agents are noncommittal about which product or company you purchase, so they are less conflicted. Cunningham ended up buying two: one from Allianz, the other from Great American Insurance Group. Insurance companies have yet to figure out just how to comply with the new Labor Department regulations - one executive at compliance consulting firm ACA Compliance called the law "Affordable Care Act Junior". "Think of the DOL rule as Obamacare for retirement planning," Borton said. "It is complicated, contradictory and will be added to, modified, and challenged in court. The industry will change and adapt, but how is still unknown." The need for new rules was highlighted when MetLife was fined $25 million in May for telling customers that new annuities were cheaper than the products they were replacing. Last month brought the launch by Stan Haithcock, an independent agent, of Annuities.Direct, which enables investors to buy annuities directly, bypassing agents. "Consumers are embracing the newness of not having to use an agent and not being pressured by an agent," Haithcock said. On the site, annuity fees are lower, he added, although still not as transparent as they could be. "Commissions are often built into the annuity, and if you buy via our website, the commissions range from 0.50 percent upward of 3.0 percent annually, depending on product and carrier," he said. "We're hoping to force that transparency on the industry." Financial advisers say annuities can be helpful in retirement - but only for a portion of your assets, and definitely not all your assets. "Say we have a client with $1 million who chooses to put $200,000 into an annuity with an income guarantee. That's suitable for them. But no annuity is good enough for all your assets," said Mel Novak, a registered investment adviser in New London Township. Said Greg Sarian with HighTower Advisors in Wayne: "It's entirely appropriate the DOL applies the fiduciary standard to retirement investments. As a registered investment adviser, I'm already a fiduciary. So when my client buys an annuity, I receive no commission. . . . What are the costs and the real returns? Are these appropriate at your age? What are the fees - invisible and embedded?" "Upon your death, the annuity goes to a beneficiary. It's earmarked for them and doesn't go through probate or pass through a will, as your other assets would."